- I have not been able to get the game to crash on Zoon Kitchen 2 and/or Toys in the Attic. Either i inadvertently fixed it or it requires a very specific action. Please let me know if you guys can crash it. - The checkpoint finder... it's functional but it is still a mess. However, there is no way I can improve it without significant code rewrite. The finders rely on 3 different files, .raw, .act and .aai. Raw and Act are easily obtainable with FlyRaw but .AAI is not. It's an anti-aliasing mechanism and the game simply crashes without it. Hence there is no way I can make it 100%. Meh. Have to go through the code and remove any sort of dependency on this file. The dashboard also makes heavy use of AAI which also means I got no chance of getting that to work properly either. - I am not able to lock out the non-3dfx compatible resolutions. I have come to realize the game doesn't have a mechanism to tell itself apart from 3dfx or direct3d. It only tells itself apart from software. Instead I chose to label 3dfx the two workable options. 640x480 and 856x480 (remember, for 856x480 you need to set nGlide to stretch the screen to end up with proper wide screen). - Instant Replay is fugly but I have no desire to spend my immediate time making it pretty. Maybe I will fix it eventually but it's extremely low priority. However, I do want to point out something weird is going on with the zoom out button. I haven't been able to find why. Most of the the time it doesn't render correctly and it overlaps the other buttons. You might have to open the replay window several times until the button works properly (it doesn't display correctly but it doesn't overlap the other buttons). - About screen doesn't work. 4/5 it crashes. - Software mode crashes on some tracks (like Fila's Adventure) but Direct3d/3dfx works fine. - While you guys are testing this I will fix About screen + the two loading screens. If no other significant issues come up, once I have the new screens ready I will launch this as the first community patch. And after the release of the community patch I will start investing time into improving the game like increasing the draw distance even further, increase object limits and trying to get the dern menu to disappear under Win8/10 (this menu thing has become essential due to the finder only half working) etc. I will post a more detailed thread about what the future holds once the full release is upon us. I found the code that positions the finder, so as as quick workaround until I figure out the menu thing will be to move the finder just a little lower. Search for a few of those in code, such as DrawMenubar. The issue is probably around there somewhere. I wouldn't be surprised if the game always drew the menu, and then drew the game frame overtop of it on the same buffer. And some change in Windows prevents that from working. If necessary, on the game load, use GetMenu to retrieve the handle, then removemenu. I am not actually sure how to put the menu back afterwards. I was on the hook, and pressing F to turn off the broken finder, and that happened. Hmmm... I do think there is indeed particular situations in which it crashes and it might have something to do with the vertexbuffer. I'll try increasing that. In the meantime I toyed around with increasing the draw distance even further and while I did get it to work but there's issues. Number one issue is that the framerate drops between 5-10fps on Win 10 on object heavy tracks. I am confident to say that this problem is related to the obsolete rendering engine that simply cannot handle so many vertices efficiently. I can implement the draw distance but some tracks will have issues(an example is Fila's Adventure and Alpine's Certifiably Crazy). The ideal scenario is obviously porting the game to dx9 which would probably take care of that. Meh. Yeah 9 would be freaking hard. Could probably do 7 or 8 though. A lot changed between 8 and 9, making porting very difficult. 7 or 8 might literally just be changing the references and solving compile errors. I've never done it myself though. As for the performance drop, are you using the 3dFX or the DX version? Your current version for me on 4790k is easily exceeding 60fps in every track I tried when using the DX version. It's a performance drop all across the board, in 3dfx, dx and software and happens at every resolution, including 640x480. OK, Zkitchen has started crashing for me too. It's weird that it didn't crash for all the times I tried it earlier (must have been over 10 times). And the reason it's crashing is not what I thought it is so meh. Have to try and figure this out. 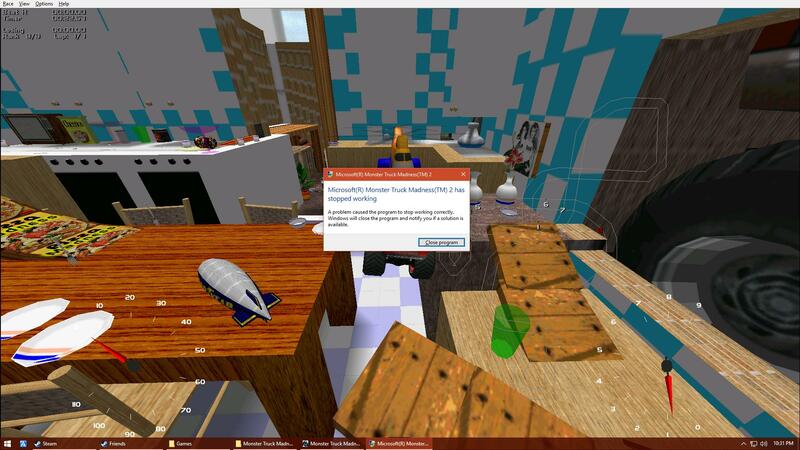 I'm starting to think the crash on ZKitchen might be in some way connected to the animated textures and objects. If you notice, the animations look like they are on fast forward for the arrows and for the fans (until you get close to the fans, then they behave normally). Hmmmmmmm. If the draw distance is decreased then it works fine. Sigh. Spent the whole day on this and I'm not any closer to finding out what's happening. Also it doesn't help that ZKitchen seems to be a special scenario. Love the work you're doing - here's my experience with the new beta so far. 1) No problems with vertices now. I've been able to turn the tire tracks back on and everything works fine. 2) Perhaps it's unique to my system, but the checkpoint finder is working just fine for me. I'm running Windows XP, in case that matters. I think I shared that in the last thread but maybe it'll be helpful to post it again. If I had to guess, because Toys in the Attic and Zoon Kitchen 1 & 2 have elevated tracks, the blimp ends up being crowded by objects and the game struggles to render it. In the last beta, it looked to me like the blimp was "freaking out", blinking in and out of existence right before the game crashed. I don't know how the blimp works - if you can just set it to always be much higher in the sky, or if it would be more practical to just mod the affected tracks so the blimp is up and out of the way. But if nothing works NOBLIMP.pod solves the issue, and all three tracks run perfectly for me now. The new menu screens look great, I'm very impressed. As you get towards the end of modding this game, I have a bold suggestion to make. It might be a lot of work though, so let me know if you're interested. 2) What resolution are you running at? 3) Yeah The blimp has a connection to the problem but it's not just that. I took out the blimp and hasn't crashed anymore but it's still not right. The helicopter (if you call it for example) will "freak out" just like the blimp does. And so far I have not been able to figure out why. I can't tell if it's the elevation, or the overload of animated models or what. The sheer number of models should not be the problem but if the draw distance is decreased then it works fine. Since I made the changes trying to fix it initially, I have not been able to get it to crash on Toys and ZKitchen1. It works great on my end and the blimp/helicopter behave normal. It's only ZKitchen2 that freaks out. I'm running the game at 1440 x 900. I haven't noticed any issues with the checkpoint finder at all. As for my suggestion, I just checked the source code thread and you may be a step ahead of me. I noticed stuff like the mtm1 drag racing code is still there. re-adding drag races etc I'm totally up for trying to implement. It would be great if you could re-add the drag races some point down the line. I know you might need to create new menus to make that work so if that is the case and you'd like any help I'd gladly do my best. Yeah at 1440x900 the finder is mostly fine. Once you go above 1280x1024 it starts getting messy. Well then, maybe it's time for the blimp to die? I'm thinking of adding a button that allows you to disable the blimp. Even though technically if you use sparse scenery it should disable blimp. Btw bconley, what XP version are you running? With service pack3? Windows XP professional with service pack 3. Yeah figures. Someone was trying to get it to work on SP2 but it won't. SP3 is probably the minimum required because Microsoft. Interesting that in running the game, the menu bar appears, but doesn't show up in these screenshots, so there's obviously a DirectX thing going on there.